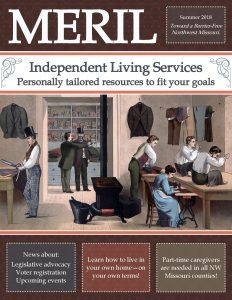 News – MERIL – Helping People with Disabilities Live Independently! Sign up for our quarterly newsletter and follow us on Facebook and Twitter to learn about disability resources in our community. 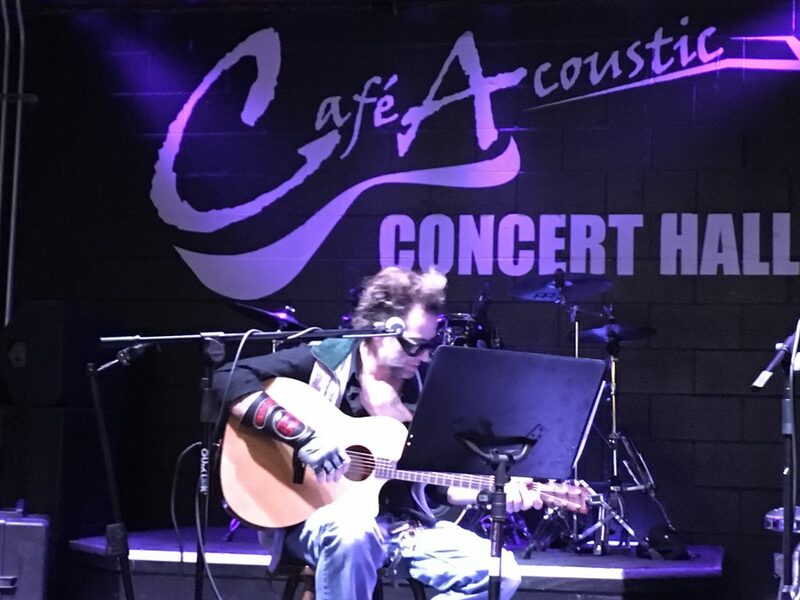 On April 15, MERIL hosted the “Acoustic Noodles” fundraiser at D&G Pub & Grub in St. Joseph. The purpose of the event was three-fold: (1.) to raise funds for our Independent Living Program, which helps people with disabilities live independently in the community; (2.) to raise awareness about MERIL; and (3.) to enjoy great music by local band The Devil and the Southern Fellowship. For the last three months, MERIL has been blessed to have an intern work with us to fulfill his requirements for graduation and to get some hands-on job training. Will Vick did a great job for us using his phone skills to line up in-services at a variety of Emergency Medical Services offices in our catchment area, selling tickets to the “Acoustic Noodles” fundraiser, assisting those with low vision and blindness, and getting local restaurants to sponsor our “Silent Lunch” Deaf and Hard of Hearing events. Will was also instrumental in assisting Lisa Gabriel with our Youth Pre-ETS event that will be held in June. Once Will was given a task, he tackled it with abandon until it was finished. We have not seen the last of him since he will be volunteering for MERIL until he finds employment. Thank you, Will! We raised $878 during our first annual Acoustic Noodles fundraiser! We are planning to host a similar “Acoustic Noodles” event next year. Stay tuned for more information. In the meantime, you can view photos and videos from this year’s fundraiser at www.meril.org/noodles. 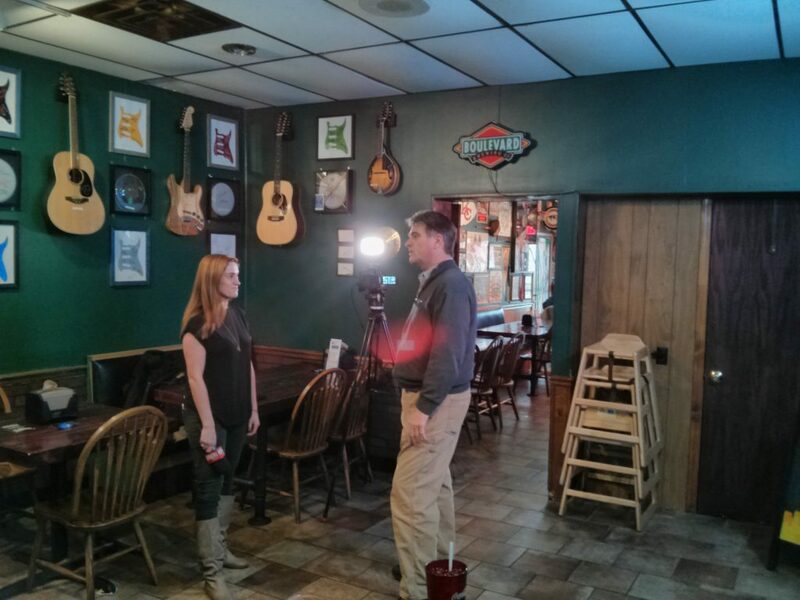 News-Press Now reporter Kristen Carver (left) interviewed Rob Honan during the benefit. Click here to read the news story. The Devil and the Southern Fellowship put on a great rock ‘n’ roll show after the spaghetti dinner. 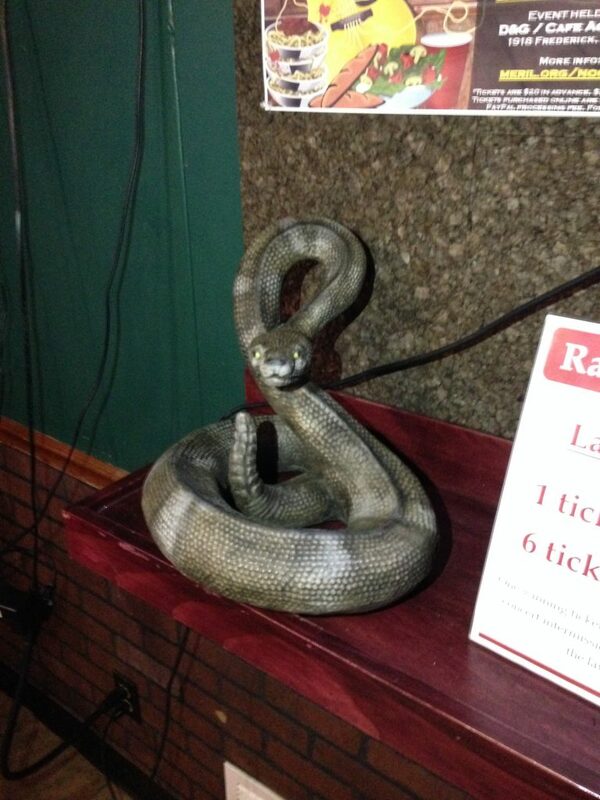 Twilight Gardens donated a rattlesnake lawn statue for us to raffle during the fundraiser. Two-and-a-half years ago, Michael Van Sickle had an unexpected seizure, which resulted in brain bleeding. After emergency surgery in Kansas City, he underwent recovery in Lincoln, Nebraska and Keokuk, Iowa. 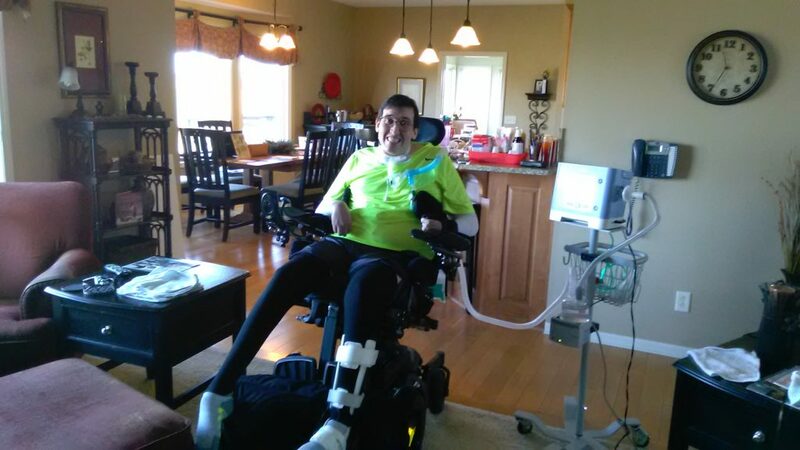 Mike was not able to move to a rehabilitation facility closer to his Northwest Missouri home because no facilities in Missouri are equipped to care for a person who is quadriplegic and vent-dependent. Mike’s mother and guardian, Pam Van Sickle, spent hours researching online for options that would allow Mike to return home. She discovered the Money Follows the Person program and contacted MERIL for more information. Lisa Gabriel, MERIL’s Money Follows the Person coordinator, met with Mike and Pam to begin the process of transitioning Mike from a rehabilitation facility to his own home. Now, Mike lives at home and is able to spend time with his family. Mike also participates in MERIL’s Consumer Directed Services (CDS) program, allowing him to hire two caregivers to help him with personal care tasks. Mike said he likes to be able to manage his own care and hire his own attendants. Pam said that Mike is much happier now that he is able to be around his family and friends. Lisa and CDS Specialist Lauren Lynch visit Mike periodically to discuss other resources available to him. from Missouri Assistive Technology to help him obtain a transfer and mobility (TRAM) device to assist him with standing. Mike has set a goal for this summer. He wants to be able to stand at a wedding he will be attending in June. With the help of MERIL’s Independent Living programs and other community resources, he is well on his way to attaining this goal. We wish you the best, Mike! Mike is increasingly independent living at home with his family. 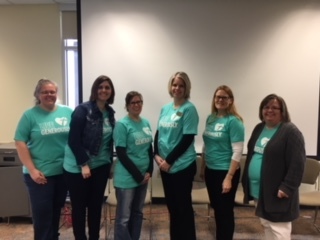 At Northwest Missouri State University in Maryville, teachers and IEP students in 7th through 12th grade learned about the skills needed to succeed in life after school. 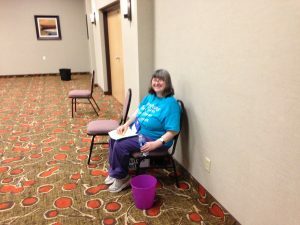 The Regional Transition Network (RTN)—which consists of members from several agencies, including MERIL, throughout the Northwest Missouri area—hosted the event. 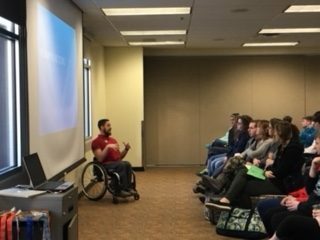 This year’s keynote speaker was John Gilbert, a Paralympian wheelchair basketball player who won a gold medal in the 2016 Rio games. John grew up in Fairfax, Missouri, and began using a wheelchair when he was six years old after a spinal cord injury. He started playing wheelchair basketball when he was 10, and he has continued since. 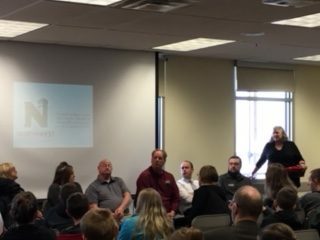 From John and the other presenters, attendees learned about the significance that discipline, goal-setting, and self-advocacy can have on employment success. John Gilbert (left) delivers his keynote speech to the audience. 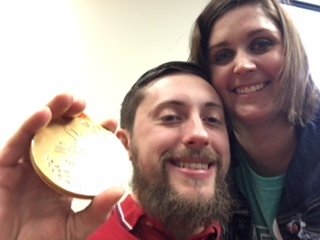 John Gilbert (left) shows his gold medal, with MERIL’s Lauren Lynch. RTN members wearing Thrivent “Live Generously” shirts. Panel members speak to the audience and answer questions. 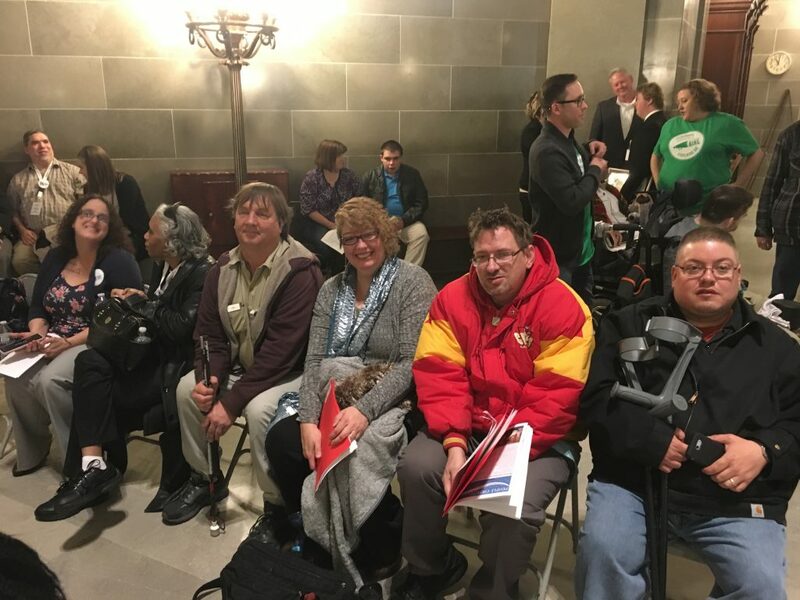 Several hundred disability rights advocates from all over the state, including five from MERIL, converged in Jefferson City on March 14 for the 17th Annual Disability Rights Legislative Day. Advocates heard speeches about disability pride, guardianship legislation, ABLE accounts, Home and Community-Based Services, and Independent Living funding. 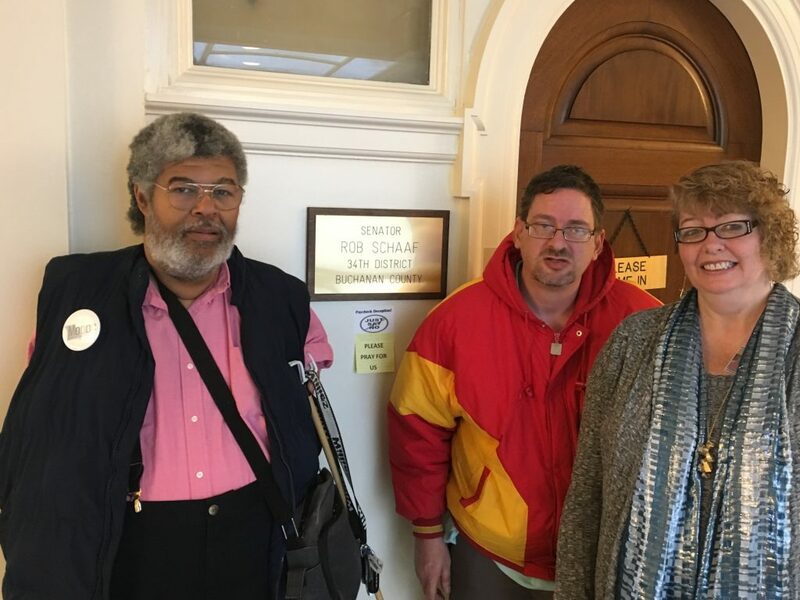 In addition to the speeches, advocates visited their state legislators to urge them to think of the disability population when making decisions on pending bills. MERIL was represented by staff members Jay Claywell, Lisa Gabriel, Rob Honan, intern Will Vick, and program participant Chris Fagan. The MERIL group visited all six house members and the two state senators in our service area. The message that we provided to our legislative delegation was that Centers for Independent Living (CILs) are critical agencies that keep individuals living in the community of their choice and that a major way to do this is to support HB 2002 (an appropriations bill) that would restore $1.8 million worth of state funding to the 22 CILs in Missouri. This is a significant restoration of what we lost last year and would be extremely beneficial. The legislators are on spring break next week and there is still a lot of work to do. Please contact me at 816-279-8558 or rhonan@meril.org if you have questions or would like to assist us in our advocacy efforts. We made our voices heard in Jefferson City. Now it’s your turn! Contact your state legislators: http://www.senate.mo.gov/LegisLookup/Default.aspx. 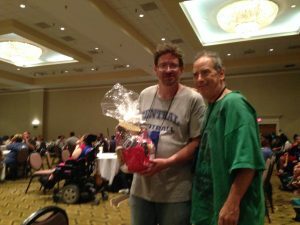 Read the GCD legislative updates: https://disability.mo.gov/gcd/legupdates.htm. 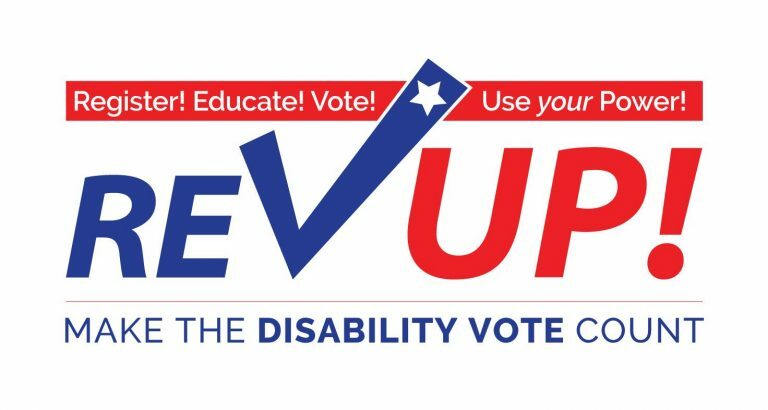 Learn about accessible voting: https://www.sos.mo.gov/elections/goVoteMissouri. From left to right: Rob Honan, Jay Claywell, Sen. Dan Hegeman, Chris Fagan, Lisa Gabriel, and Will Vick. From left to right: MOSILC Executive Director Adonis Brown, Chris Fagan, and Lisa Gabriel. From right to left: Jay Claywell, Chris Fagan, Lisa Gabriel, and Will Vick. As we move into February, the legislative session in Jefferson City is in full swing. Governor Eric Greitens published his departmental budget recommendation on January 23 for the Independent Living grant. Administered through the Division of Vocational Rehabilitation, he recommended to keep the Independent Living grant flat funded (no increase) from last year. As you may recall, we took a 40% cut from the previous year’s allocation, and we are hoping to restore all or part of these funds. Given the current budget climate, this will be difficult, but is possible. In order to make change possible, Centers for Independent Living must advocate for our legislative issues and educate our legislators about the importance of this and other programs and bills. MERIL has set up two workshops to assist in preparation for the March 13 advocacy day in Jefferson City. The first will be in conjunction with the People First of St. Joseph meeting on February 8 at 3:00 p.m. The second one will be held at noon on March 8. Both workshops will serve food and will be held at the MERIL office in St. Joseph. Call or email me for more information: 816-279-8558, Rhonan@meril.org. Jane Parman was living in a nursing home due to a broken femur and a cancerous tumor. She heard about MFP and asked the nursing home coordinator about the program. The coordinator referred her to MERIL, where she met with Lisa Gabriel to discuss the options available to her. Jane found an accessible apartment in Andrew County, and she has been living independently since November 2017. When asked how her life has improved since moving into her apartment, Jane said she loves the quiet, she sleeps great, the laundry facilities are accessible, and she likes the social interaction with other residents. Jane said she can’t wait until spring when she can sit on the patio and sip some tea and lemonade. 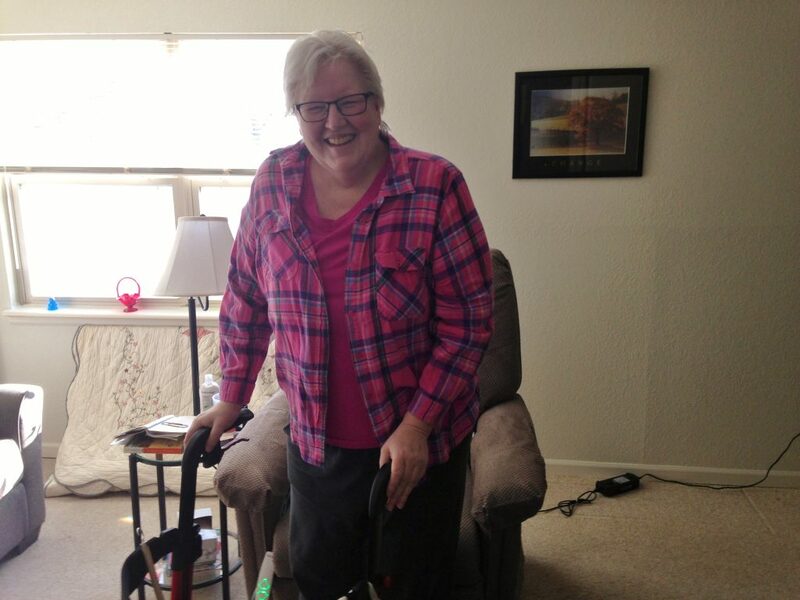 “Without MFP, I wouldn’t get the resources to help me with independent living,” Jane said. Contact MERIL for more information about the MFP program. You can also visit http://dss.mo.gov/mhd/general/pages/mfp.htm to learn more. Jane is enjoying life in her own apartment. The entrance before the renovation. The entrance after the addition of an accessible ramp. 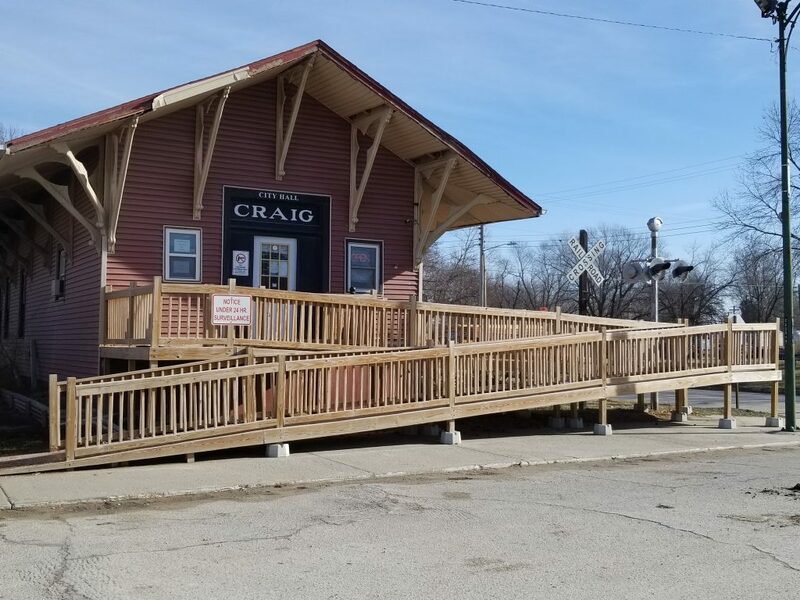 The city clerk of Craig, MO contacted MERIL for assistance in planning the addition of a ramp at the entrance to the town’s city hall building. Paul Bergonzoni from MERIL assessed the building and found that the stairs to the entry presented a challenge because of the height of the entryway above ground. 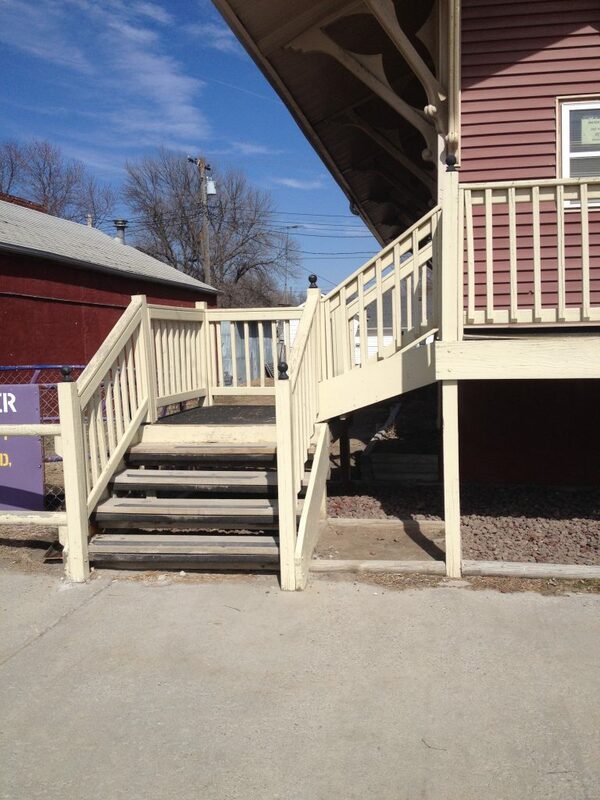 Many rural areas struggle to afford the changes needed to improve access to their existing facilities, so Paul recommended that a transition plan be developed so the city would have a timeframe to achieve the addition of a ramp. It took a few years, but a ramp was installed, and now those who use wheelchairs and other mobility devices can safely get in and out of city hall. As you can see from the photos above, a lot of materials were needed in order to achieve this goal. MERIL thanks those who worked to build the ramp and make city hall more accessible to the Craig community. On February 13, MERIL will present a featured guest on Live at Five. 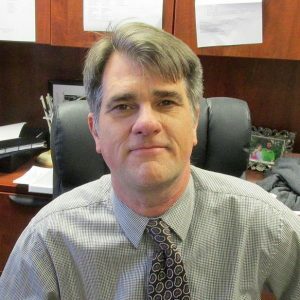 David Pearce from the state treasurer’s office will share information about MO ABLE savings and investment solutions for Missourians who developed disabilities before the age of 26. 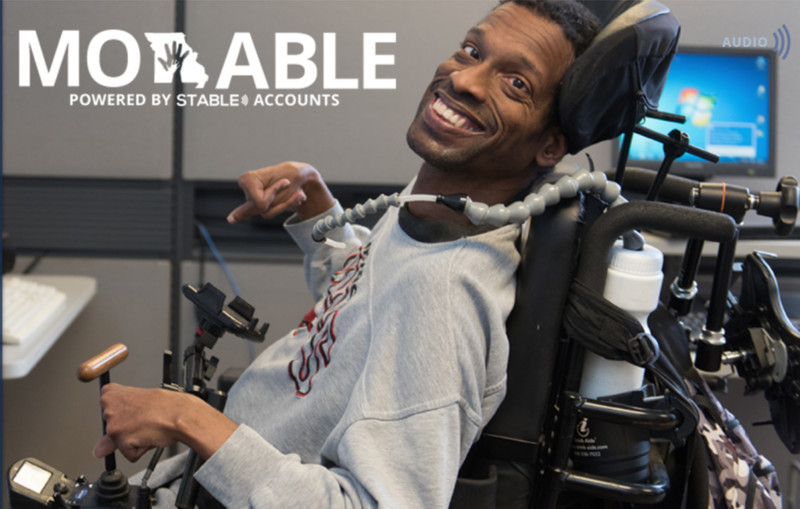 The MO ABLE accounts feature a tax-free savings plan for disability-related expenses, as well as the ability to save and invest up to $15,000 per year without losing federal needs-based benefits. Visit www.moable.com to learn more about the program. 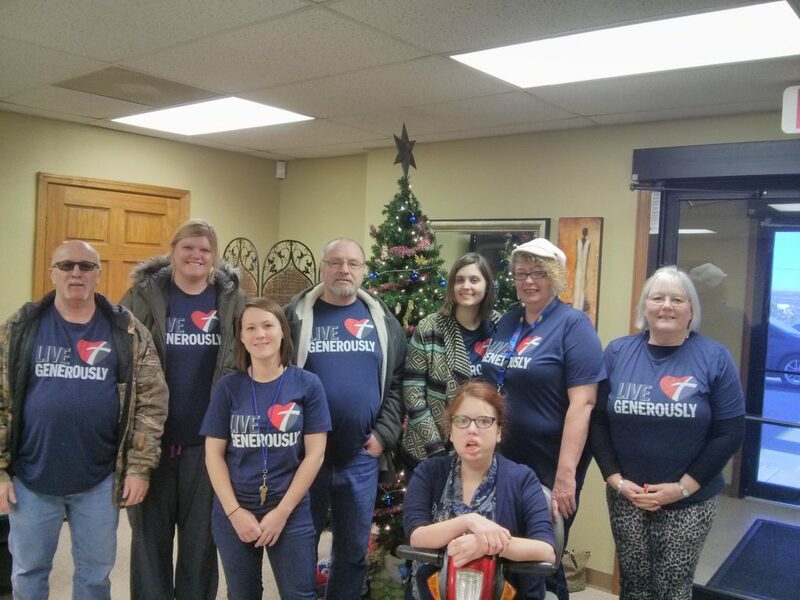 As we begin the new year, MERIL continues to serve individuals with disabilities in Northwest Missouri, to provide participants, family members, and the community the resources to live in the community of their choice. I see a great 2018 shaping up, where we not only continue to provide services but increase options through our assistive technology and consumer assistance fund programs. The new year also gives rise to the new Missouri General Assembly. The MO legislature began its yearly session on January 3rd, and it will end on May 18th. Because much of what we do depends on funding from the General Assembly, we pay close attention to appropriations (HB 2) in the Department of Elementary and Secondary Education (DESE), which funds the Independent Living Grant, and HB 10, which is the core funding for the Consumer Directed Services program. These two bills are key funding bills that are essential to our participants. As part of our efforts at advocacy, we are inviting you to the March 13th Legislative Day at the Capitol. This advocacy event will showcase speakers from all over the state and highlight issues pertinent to this year’s session. As a precursor to this event, MERIL is offering a training on March 8th at our St. Joseph office. Contact Rob Honan for more information about the Legislative Day itself and the advocacy training on March 8th. We wish all of you a great year! One year ago, Jessica Zielinski contacted MERIL to learn about resources for people with disabilities in Northwest Missouri. Jessica was living in a nursing home in Maryville, recovering from a brain tumor surgery. She had experienced stroke-like symptoms and had limited ability of her left leg. She had been in the nursing home for about a year, and was now ready to move into a place of her own. Because she was eligible for MFP assistance, Jessica began discussing the process with Lisa Gabriel at MERIL. Jessica said she had never lived by herself, but she was comforted by Lisa’s guidance. “My apprehensiveness grew to excitement when Lisa said that she could help me,” she said. Jessica searched for an apartment that would work for her. With the financial assistance from MFP and the support from MERIL, Jessica moved into her apartment in December 2016. A year after her successful transition, Jessica said she loves independent living. 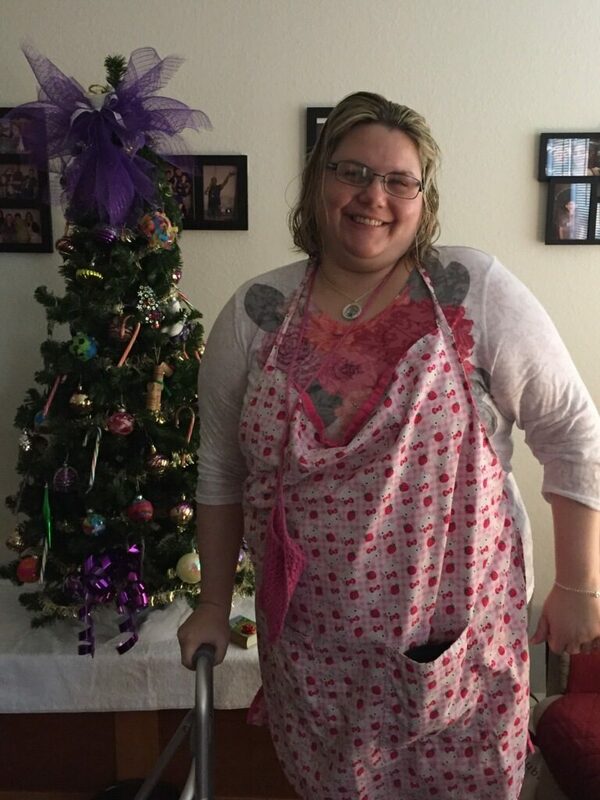 Jessica in her own apartment in December 2017, a year after using MFP to move out of a nursing home. December is a time of reflection, a time to spend with family and friends, and a time to reflect on the past year. This year has seen a great deal of change at MERIL. Since the beginning of the year, two large parts of MERIL, Angels Home Health and Bridge Interpreting, are no longer part of the MERIL family. In addition, state budget cuts have significantly impacted the Independent Living and the Consumer Directed Services programs. Yet, our staff has responded by being more creative and assertive in its approach to service delivery. We are implementing more grassroots marketing techniques and thinking outside the box on how to keep existing participants and attract new ones in the CDS and In-Home programs. On the Independent Living side, our staff has responded by providing the community with a great deal of information on the “Live at Five” television program, implementing a strong “Silent Lunch” for Deaf and Hard of Hearing participants in the community, and continuing to provide resources to thousands of people, groups, businesses, and government entities in Northwest Missouri and around the state. I am blessed to have a great staff, board, and community that supports Independent Living. I am looking forward to a productive 2018. 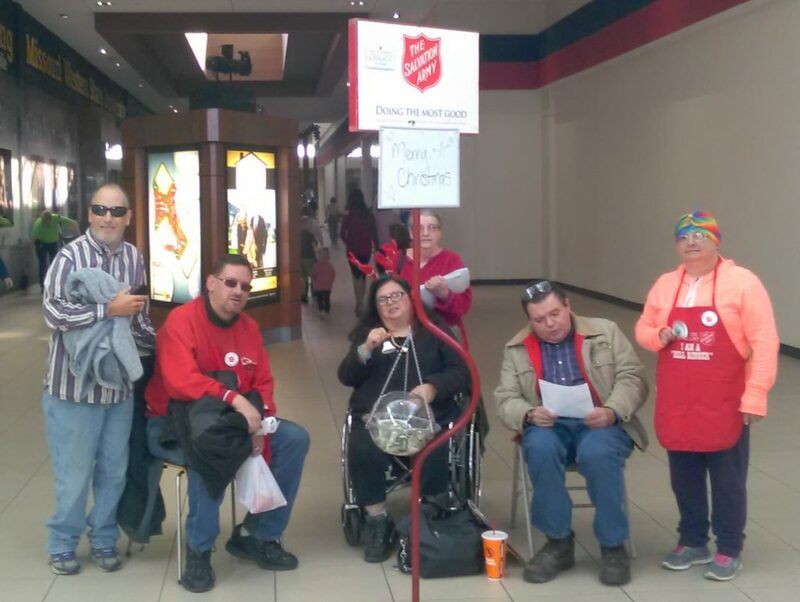 On December 2, the People First self-advocacy group rang the bell for Salvation Army to collect funds to help people have a better Christmas this year. The group had a great time greeting customers entering the mall as they started off with singing Christmas carols: Jingle Bells, Silent Night, Rudolph the Red-Nosed Reindeer, and their favorite – Deck the Halls with Boughs of Holly! Lisa Gabriel and Sharon Courter from MERIL assisted the group. They said People First is a phenomenal group, and there is nothing they would rather do than spend the day with such wonderful people. Front (from left to right): People First members Gary, Chris, Lydia, Charlie, and Leona. Back: MERIL advisor Sharon Courter. Our Thrivent Action Team at MERIL took part in a community project this month to support veterans by purchasing and donating items to Red Cross for the Veterans Sundry Drive. The team—led by Ron Gabriel—purchased clothing, personal care, comfort, and recreational items. And we had a great time shopping! Veterans—many of whom have disabilities—are near and dear to our hearts. 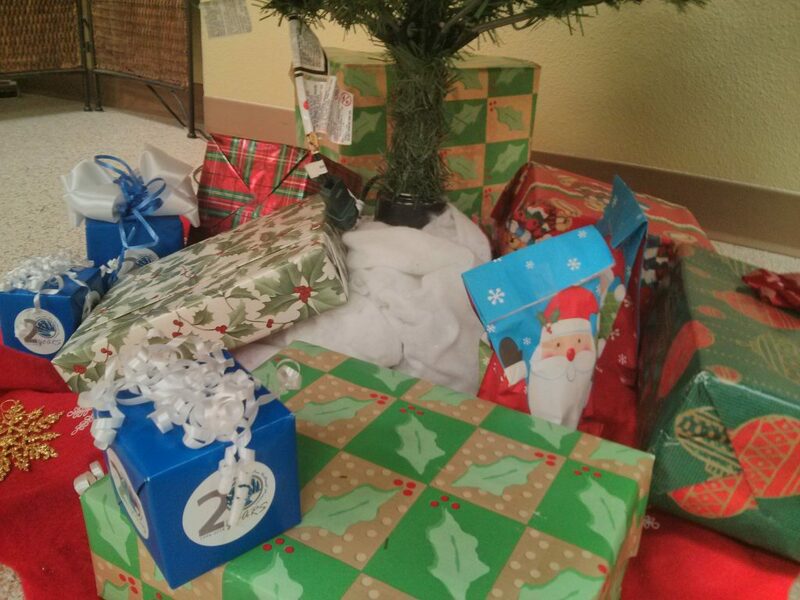 We are fortunate that we are able to help them with their independent living needs. We would like to thank Thrivent and Red Cross for their contributions, and we would especially like to thank all of the veterans in our community. We appreciate you! Front (from left to right): Shawn Appleby, Ashley Nichols, and Monica Boeh. Back (from left to right): Rachael McElvain, Ron Gabriel, Lauren Lynch, Lisa Gabriel, and Liz Alder. 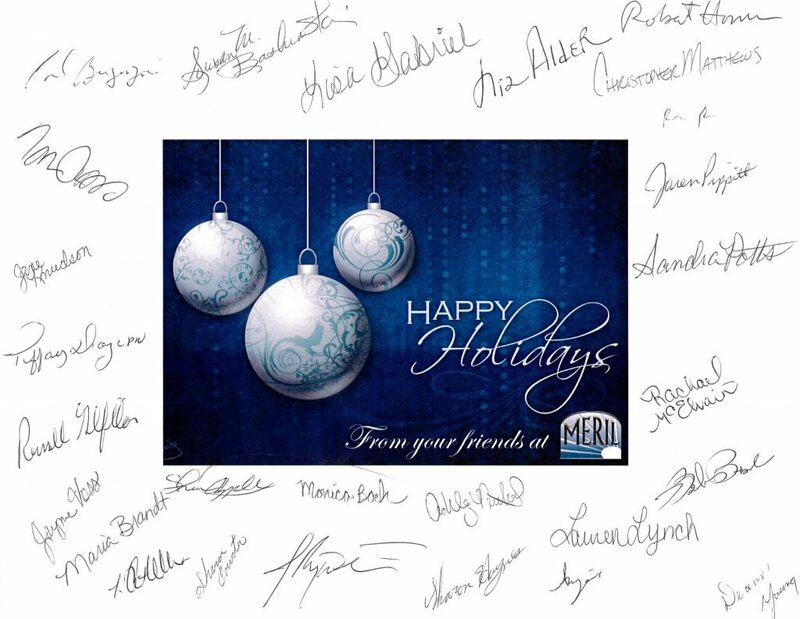 We at MERIL wish you and your family a happy holiday season! As MERIL is rapidly moving into the holidays, with Thanksgiving just around the corner, I am pleased to present another edition of the MERIL newsletter. I hope that you enjoy it. In this edition, the Rehabilitation Council for the Blind’s Public Forum, the Assistive Technology Spotlight, the In-home program, and the “Featured Attendant” are all featured. 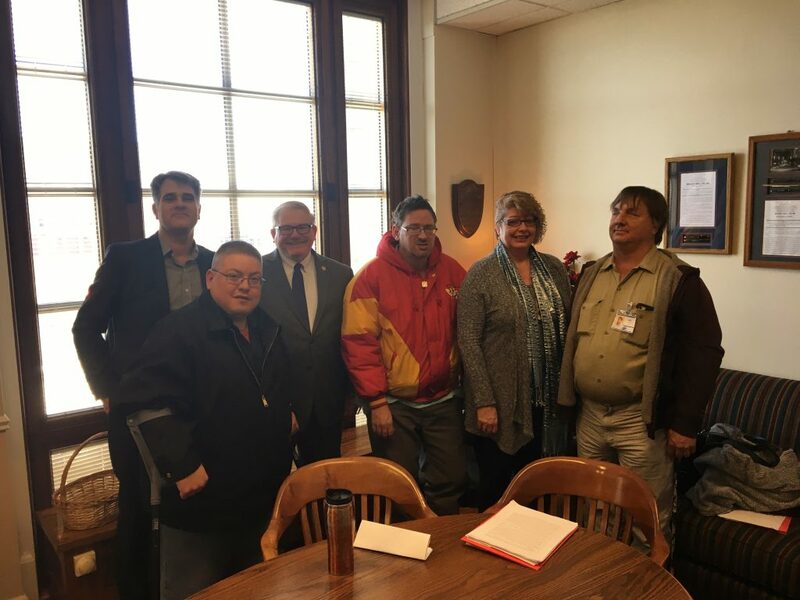 And I want to make special mention of the home visit that Russell Gilfillan did with participant Amber Olney in Maryville, with State Senator Dan Hegeman as a special guest. The education for Senator Hegeman will go a long way going into the General Assembly in January. As always, please share this newsletter and give us feedback. We always like to hear from our readers, and we welcome you to sign up to receive our newsletters via email. Our newsletters are posted on our website (www.meril.org/news) and on our Facebook page (www.facebook.com/meril4u). October has long been one of my favorite months. The days are cooling off, football (both kinds: soccer and American) is in full swing, we are in the middle of the baseball playoffs (next year, Royals), the leaves will soon be falling, and the holidays are looming, especially Halloween. And here at MERIL we are bustling with activities and providing resources to people so they can live fuller lives. 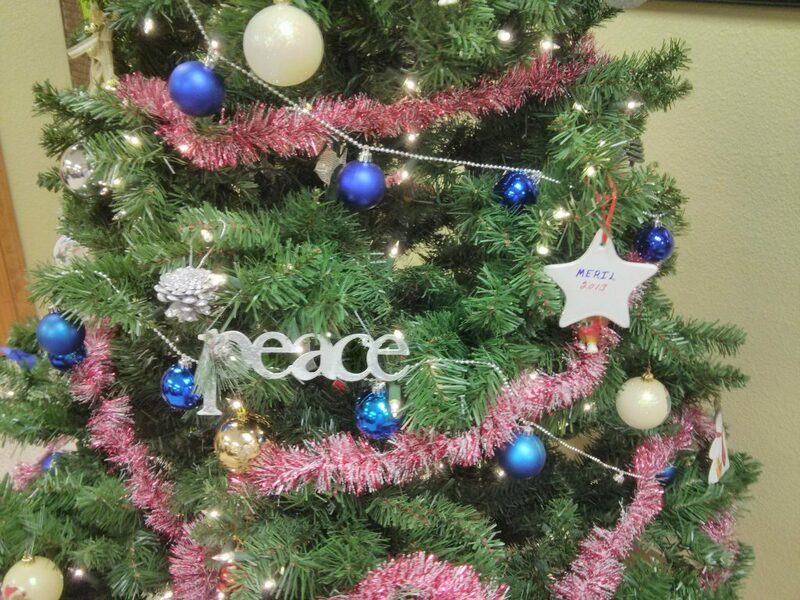 This edition of our newsletter highlights what the busy MERIL staff have been doing recently. Lisa Gabriel provided two articles: Youth Pre-Employment Summer Program and a recap of the Real Voices, Real Choices conference. 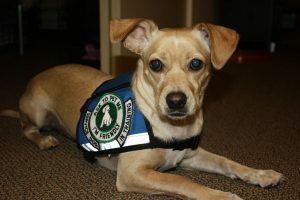 There is a brief article about service animals and some excellent information from the Governor’s Council on Disability. Jay Claywell contributed the “featured attendant” segment this month, and Paul Bergonzoni discusses one of the devices in our assistive technology room. 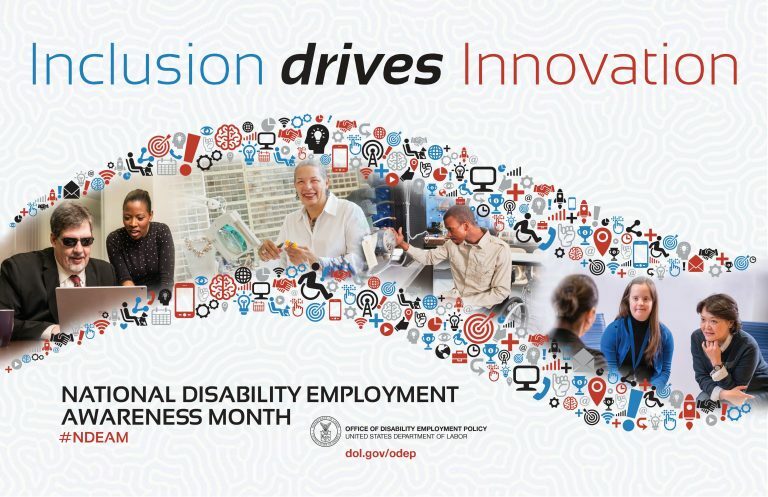 National Disability Employment Awareness Month is celebrated each October, and we have provided some resources for workplace inclusion. As always, we welcome your feedback and look forward to seeing you in the future. MERIL is proud to serve Northwest Missouri. 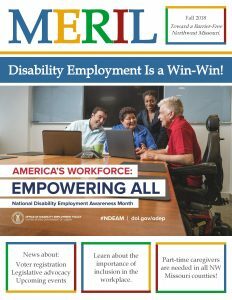 It’s National Disability Employment Awareness Month (NDEAM)! As a Center for Independent Living, more than half of MERIL’s board members and staff have a disability. We know the importance of inclusion in the workplace, and we have seen many examples of how simple workplace accommodations can allow an employee’s abilities to emerge, letting them fully contribute to an organization or company. MERIL can provide education and advice for businesses and other organizations regarding workplace accommodations, ADA compliance, emergency preparedness for people with disabilities, health and safety resources, and more. Please call us for more information. You can also learn a lot from the resources featured on http://dol.gov/odep. The use of service animals is a necessity for many people with disabilities. 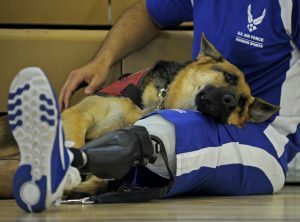 Service animals must be trained to perform a task for an individual with a disability. Emotional support animals are not trained to perform a task and only provide comfort to an individual. There are also different laws that govern training and what is acceptable in public accommodations (stores, hotels, doctors’ offices, etc.) and in housing. The Missouri Governor’s Council on Disability (GCD) has published an excellent and informative video outlining some important concepts around service animals. You can find this information on the GCD website: http://disability.mo. gov/serviceanimals.htm. In addition, if you are in the St. Joseph TV viewing area, Laura Mueth from the GCD will be the featured guest on KQ2’s “Live at Five” TV show on October 10 at 5:00 p.m. She will bring her service animal, Syler, for a short demonstration and will talk about service animals. MERIL appears on Live at Five on the second Tuesday of each month. Captioned videos of our segments are available on our Facebook page: www.facebook.com/pg/MERIL4U/videos/. Participants from People First of St. Joseph and MERIL staff members attended the Real Voices, Real Choices conference in August. 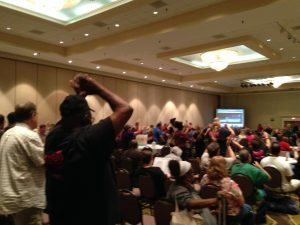 The conference featured several events and resources for people with disabilities, including information about self-advocacy, employment, healthy living, and social support. Lisa Gabriel, from MERIL, said attending the conference was a fulfilling experience. More information about the conference can be found here: https://dmh.mo.gov/constituentservices/consumerconference.html. People First is a non-profit self-advocacy organization formed by and facilitated by people with developmental and intellectual disabilities. There are two People First chapters in Northwest Missouri: one in St. Joseph and one in Maryville. 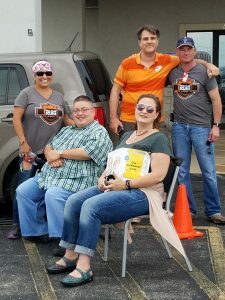 MERIL nets $3,400 in solar eclipse fundraiser! August 21st was a day that MERIL and St. Joseph will never forget. It was the day of the highly anticipated solar eclipse, the first total solar eclipse in the continental United States since 1979. For months prior to the event, MERIL staff had been diligently planning for the “once in a lifetime” event. The months of planning paid off. MERIL staff started taking reservations in May and slowly as the summer progressed, we received more and more. The staff worked with the city, county, its neighbors, and the media to make sure all the “i’s” were dotted and the “t’s” were crossed. On the Saturday and Sunday before the event, MERIL hosted individuals and families from over 12 states and one foreign country. The scene was like a mini festival. Hot dogs and coffee were sold, as were raffle tickets for a 40” TV. People were mingling with people from all over the United States and it was a blast. Though the day of the eclipse did not produce the sunny sky that we had hoped for, enthusiasm remained high. The two-plus minutes of darkness, even under the cover of clouds, was pretty cool. MERIL provides five core services, with advocacy being one of, if not, the most important service we offer. Advocacy can take two primary forms: personal and systems. Personal advocacy means using information and laws to fight for oneself on the job, in housing, in transportation, and even at the store. Personal advocacy boils down to sticking up for yourself—using the tools of information and the law. Systems advocacy is fighting for what is right and selling an idea to members of the legislature, city council, or Congress. Systems advocacy means that citizens work with and advocate to elected bodies in order to enact societal change. These are the laws that govern society and they come from lawmakers. (1.) Contact Jay Claywell, MERIL voter registration deputy, (2.) go to the Buchanan County Clerk’s office and fill out a registration form (bring a photo ID), or (3.) contact the MO Secretary of State’s office: GoVoteMissouri.com or 800-669-8683. You must be registered to vote by October 11th for the November 7th election. And, once you are actually registered to vote, go vote! There is an old saying that goes something like this: “You don’t have a license to complain if you don’t vote.” So go and make your voice heard. Recently, two landmark laws that greatly assist people with disabilities celebrated anniversaries: The ADA recently celebrated its 27th anniversary and the Social Security Amendments Act of 1965, which created Medicaid, had its 52nd birthday. These critical laws became reality through a combination of direct action and civil disobedience, legislative work, media presence and common sense explanations that society is better off when we include everyone. After all, no one group, ethnicity, political party, rural/urban resident, etc. is immune from disability and at any time could need the civil rights protections that the ADA gives or the health care that Medicaid provides. On the federal level, there has been an effort to severely curtail Medicaid through potential funding cuts and block grants to the states. If you have been watching the news in the last month, many disability rights activists protested against in U.S. Senators’ offices the very real threats of these cuts— and these protestors are the real heroes in our movement because they were able to show and convince Congress not to pass the most recent attack on Medicaid. Medicaid is a “pro-life” issue, and is an essential tool that allows people to live at home. It is imperative that it remain and I applaud those that made sure Congress knew how valuable Medicaid is for many persons with disabilities. Advocacy: One of the five core services, and arguably the most important, works! Welcome back to the MERIL newsletter. I would like to share with you some changes we have made to our services in the nine-county area of Northwest Missouri. Since I became the CEO of MERIL, we have taken steps to streamline our organization. As a result, Angels Home Health was sold to The Whole Person, a Center for Independent Living (CIL) in the Kansas City area. We are pleased that the nurses and director continue to share our office space in St. Joseph and provide home health services in Northwest Missouri. In addition, we discontinued our Bridge Interpreting services on June 30. There are a number of qualified interpreting agencies in the area, and we are confident these agencies can meet the needs of the Deaf and Hard of Hearing community members that we have been honored to serve. We are glad many of them are able to join us for our biweekly “silent lunch” peer support group. With these changes, MERIL is now positioned to focus on providing Independent Living services (IL), Consumer Directed Services (CDS), and In-Home services. We continue to provide CDS services to over 300 participants in Northwest Missouri, and we recently expanded our In-Home program to Nodaway County (in addition to Buchanan and Andrew counties). We provide aid to those who need equipment and other support through our Consumer Assistance Fund, and our youth services and nursing home transition services, including the Money Follows the Person program, will continue to help people live independently in their own homes and communities. MERIL, like the other 21 CILs in Missouri, receives a lion’s share of its revenue from (a.) the state, in the form of the IL Grant from the Department of Elementary and Secondary Education, and (b.) the CDS funds from Medicaid. This year the Missouri legislature made many cuts to the services that CILs provide. We are preparing for the damaging effects of these cuts, and we are determined to respond in a way that guarantees our core services will be available to those who need them. Our core services are: (1.) information and referral, (2.) independent living skills training, (3.) transition services (youth and nursing home), (4.) peer support, and (5.) advocacy. 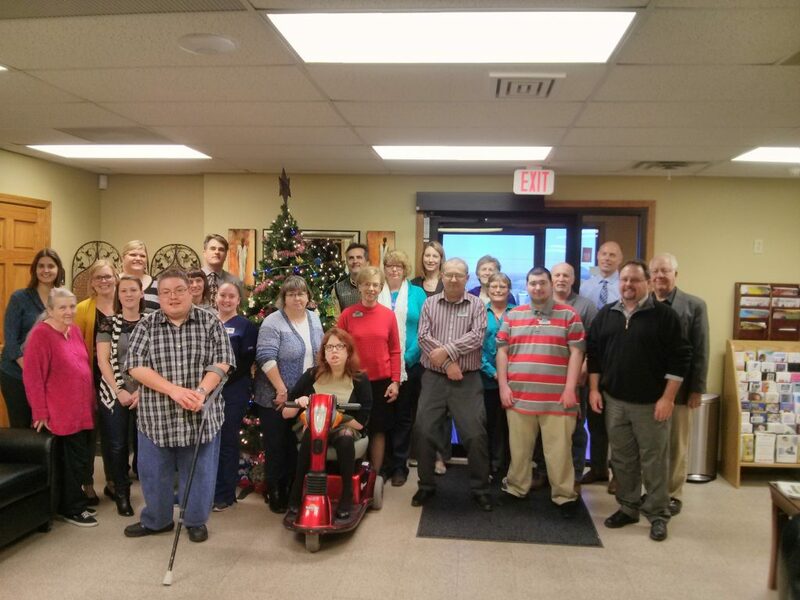 MERIL has provided these core services for over 23 years as Northwest Missouri’s Center for Independent Living, and we will continue to do so well into the future.